SOUND NUTRITION FOR A HEALTHY DOG!! We are now selling Dog food and NuVet Plus Vitamins for your convenience, so you may buy it from us if you like when you come to pick up your puppy. LOVE THEM LIKE FAMILY. FEED THEM LIKE FAMILY. Like you, We think of our puppies as family members and want them to live long, happy lives. And since superior nutrition plays a vital role in their health and development, we take great care in selecting "The perfect food"only the finest natural ingredients. With Holistic Select you can feed your puppy with the same care you feed your family. Holistic Select uses the finest natural ingredients real meat is always first followed by whole grains, veggies and fruit. a precise blend of antioxidants, vitamins and minerals selected by veterinarians and animal nutritionists. Our puppies are weaned using HOLISTIC SELECT. It's the perfect food for your furry family member. Life Protection Formula with Active Nutrients and Antioxidants for Your Puppy's Health & Well-Being. No chicken or poultry by-product Meals- No corn,wheat or soy - No artificial preservatives - No artificial flavors. Our dogs are a big part of our life and deserve the best we can provide. We have looked at and tried many brands of dog food, these brands has No corn, wheet or soy products. Excellent Value/Great Choice, thesse puppy food! Its just as good as Blue Buffalo but much more affordable. Taste of the wild has plenty of protein. Now you can buy "Holistic Select" here in our Kennels for your convenience. Although it is always best to obtain most of the nutritional value from pet foods, you may want to consider a supplemental source. We can help you choose which product will help benefit your dog the most. It is especially important to provide extra nutrition for growing puppies, working, hunting, sporting and show dogs. We highly recommend that ALL of our dogs be kept on NuVet Labs nutritional supplement, "NuVet Plus Canine" at least until the age of 2 years. IMPORTANT FACT!!! "YOUR PETS BEST FRIEND"
The results are fantastic and guaranteed or your money back. Take a few moments now to discover how much better your pet's life can be. Remember that when you fall in love with a puppy or bring a new pet home you are committing to keeping them both happy and healthy. Scientifically formulated to provide everything your pet needs for "PERFECT HEALTH"!Significantly reduce or eliminate many health problems that strike your pet. 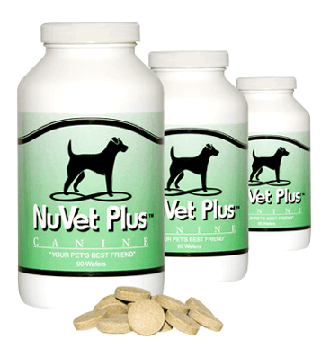 NuVet Plus Vitamin Supplement for dogs. Dosage: 1 wafer per day for dogs 5 lbs and over. 1/2 wafer if under 5 lbs. NOTE: This product is Not available to the general public without an Order Code supplied by your Pet Professional, call toll free 800-474-7044. Insider’s Secret: Thousandsof the nation’s top breeders use NuVet Plus® to keep their puppies, kittens, breeding females and males so healthy! MONEY BACK GUARANTEE: Call now to order this revolutionary product. If this isn’t the most incredible pet supplement you’ve ever had, we’ll give your money back! Pets are like people in more ways than just their personalities. Just as in humans, pets can come down with a wide variety of illnesses and diseases. Many ailments are identical to people and often times the treatments for these illnesses are the same. Pets can suffer from Allergies, Skin problems, Digestive issues, Joint aches and all manner of organ and glandular failures. Many canines and felines, especially when they get older, have health issues just like their senior counterparts. It's very common for older dogs to have Arthritis and come down with eye cataracts. Many pets will be the victims of Cancer and have to undergo similar treatments as humans experience. For many pet owners, having a sick pet is just like having an illness strike one of their children. They want to do whatever they can to find a way to cure their disease and keep them healthy for many years to come. Fundamentally the first line of any remedy is to ensure your pet has a proper diet and balanced nutrition. Supporting your pet’s diet with a high quality food containing essential protein will add critical nutrients to their bodies. Equally important is providing food, that is low on grains, like corn and wheat as well as “meat by-products”. However, even a high quality pet food alone isn’t enough. Supporting their diet with a nutritional supplement that has been engineered to support vital organs and that has the ingredients to help fight disease causing free radicals can make a big difference in their battle against infections. Nutritional supplements like NuVet Plus, that contain a rich supply of vitamins, minerals and essential enzymes offer a matrix of antioxidants and amino acids. These ingredients help protect your pet’s body from opportunistic organisms, free radicals and chemicals that can harm them on a daily basis. Formulas that contain high quality minerals, a full range of amino acids, proteins and antioxidants - help to detoxify the blood stream. Keeping the bloodstream clean allows for red blood cells to carry nutrients vital in defending against infection. As with any vitamin and nutritional supplement, the quality of ingredients combined with the manufacturing process is what determines how effective it will be for your pet. Supplement makers that are willing to put in the time to develop a truly scientifically based formula that has been clinically tested for positive results are the only kind to consider. It should also be noted that superior formulation can only go as far as the processing practices will take them. Companies that use human grade ingredients combined with manufacturing operations that are approved for human products production by the FDA. This equates to a supplement that goes beyond mere commercial value. It shows a company that puts the health of your pet ahead of everything else. NuVet Plus® offers a safe and effective way to help prevent and help heal many types of illness found in dogs and cats. Recommended by thousands of top Pet Professionals, NuVet Plus® can help heal your pets illnesses, keep your pet healthy and protected them against sickness and disease. NuVet Plus® is produced in an FDA approved laboratory used to produce human pharmaceuticals. The use of this kind of high-tech superior quality manufacturing facility is especialy uncommon in the pet industry, however NuVet Labs® knows that no greater value can be placed on our beloved four legged member of the family. NuVet Plus is guaranteed for purity, safety and effectiveness. As one of the oldest and most respected companies in the pet industry, NuVet Labs® proudly stands behind it's supplement with our 60 day 100% satisfaction guarantee*. Providing reliable service to our customers since 1997, we have helped hundreds of thousands of pets in their quest for health and vitality. The excitement of a new puppy or kitten can be made all the more joyful when they are made comfortable and well taken care of. When a new pup or kitten is ready to leave the litter, usually between 6 to 8 weeks, it’s important that certain needs be met which will help them bond with their new family. Just like a newborn child, puppies and kittens need food, water, a warm place to sleep plus lots of love. Commercial and raw food diets can leave big gaps in their nutrition. A quality nutrient supplement will provide essential vitamins, minerals, amino acids and enzymes crucial for developing pets. The first two years of a puppy and kitten's life are critical for building a strong immune system, bones and organs. NuVet Plus is a scientifically formulated nutritional supplement that helps to ensure the proper development of young dogs and cats in several crucial ways. 1. Boosts the immune system. Puppies and kittens need a healthy immune system, which is responsible for defense against disease and infections. NuVet Plus® contains Blue Green Algae which is a very rich chlorophyll source and has been shown to enhance the health of the entire body, strengthen the immune system and promote intestinal regularity. 2. Strengthens the Cardiovascular system. A young canine or feline needs a strong heart to power all that energy. NuVet Plus® contains Evening Primrose Oil, which is high in gamma linolenic acid (GLA), an essential polyunsaturated fatty acid that promotes cardiovascular health. Puppies and kittens, like children, require strong bones to support their active lifestyle. A new pup or kitten that can stand, jump and run must depend on their nutrition to give them a healthy skeletal structure. NuVet Plus uses Oyster Shell which has the proper ratio of quality Calcium and Phosphorus for optimum absorption. Along with Magnesium, these are the vital elements for the structural framework of bones. 4. Promotes a healthy Nervous system. NuVet Labs knows a kitten and a puppy’s developing nervous system needs help to stay healthy which is why we make sure to include Vitamin B3 (Niacin) as part of our formula. B Vitamins are essential, and B3 promotes growth and proper functioning of their growing nerve network. 5. Supports healthy Glands and Organs. Growing pets need real nutritional sources and one of the best comes from 100% Chicken Liver found in NuVet Plus. Paddle dried to maintain full potency of its Omega Fatty Acids, Vitamins A, C and B Complex, NuVet Plus provides essential nutrients to fuel red blood cells and make your pup’s or kitten's internal organs strong. NuVet Plus is the best nutritional supplement for young canines; perfectly balanced to provide the most effective fundamental and essential ingredients that can help defend your new puppy from toxins, nutritional deficiencies and common illnesses. Now in the prime of life, your dog or cat require more complete nutrition to sustain their active lives than can be found in commercial foods . Fully developed dogs and cats have different needs than newborn kittens and pups or even aging pets because at this stage they require nutritional support that can help them fuel their metabolism while protecting them from the onset of illness and disease. Your dog and cat at this age start to exert their bodies, running, jumping and playing at full speed. Their muscles, organs and bones work at peak performance, which means they require a plentiful supply of vitamins, minerals and proteins to supply nutrients that can sustain their abundant energy levels. Their bodies have now gone beyond the development stage and their nutritional needs are more tuned towards maintaining their prime health for as long as they can. NuVet Plus promotes a healthy life for your pet by providing key whole food source ingredients that are human grade and focused on prevention, and by strengthening their body to fight off the free radicals that can attack them and damage their defenses. 1. Proper Vitamin & Mineral Intake. Vitamins A, B, C and E, along with Iron, help fuel hemoglobin and myoglobin with oxygenated red blood cells. Vital for energy production and healthy immune system, NuVet Plus® provides a good source of Iron to help your dog “run like the wind.” Phosphorus aids the body in the utilization of vitamins, and conversion of food to energy. Phosphorus works with calcium to build bones and teeth, and aids the body in the utilization of vitamins, and conversion of food to energy. Excellent for keeping your dog on the go and in the prime of their life. Potassium Citrate is important for a healthy nervous system and regular heart rhythm. It assists in the prevention of strokes, aids in proper muscle contraction, and works with sodium to control the body’s water balance. 3. Healthy Metabolism of Proteins, Fats and Carbohydrates. Zinc is a component of almost one hundred enzymes involved in metabolic processes, most of which work with the red blood cells to move carbon dioxide from the tissue to the lungs. It helps canines and cats in their prime with injury recovery and promotes wound healing. Vitamin B (Pantothenic Acid) assists in the release of energy from carbohydrates, fats, and proteins. It also aids in the utilization of some vitamins, stimulates growth, and aids in the formation of antibodies. NuVet Plus is the prime choice for nutritional supplementation to help your dog maintain a healthy body, shinning coat and a life full of energy and fun. Just like their human companions, dogs and cats in their later years have nutritional requirements that when met, will help them prevent illness and disease helping them live long, happy and productive lives. Senior felines and canines have a greater need for nutritional support of bones and joints, as well as for particular vitamins and amino acids that can detoxify the blood and continue to strengthen their immune system. For older dogs and cats the importance of providing nutrient support for eyes, ears, nerves, joints and intestinal track is vital. Poor hearing and eyesight can cause your dog to become overly conscious of their actions, making them skittish and uncomfortable. Bladder and bowel control is more a matter of internal health problems than an inconvenience. Additionally, good skeletal support is essential for older dogs and cats, just as it is for people. NuVet Plus and NuJoint Plus have what it takes to protect your senior cats and dog from the ravages of time and illnesses and maintain their health for many years to come. These supplements are the result of over 8 years of scientific research and development with the goal to create a nutritional product that can target, control, and eliminate the source of health issues, control or eliminate them and keep your pet strong and happy for many more years to come. NuVet Plus: Is the culmination of 8 years of research and development, formulated with the goal of creating a nutrient formula that would go beyond mere vitamin replenishment and instead provide a full spectrum nutritional supplement that focuses on the root cause of illness and disease while boosting your pet’s immune system and overall health. It contains vital ingredients that have been shown to promote healing and longevity. NuJoint Plus: Is a premium natural anti-inflammatory hip and joint therapy and uses only the highest quality pharmaceutical, human grade ingredients like Glucosamine, Chondroitin, Methylsulfonylmethane (MSM) and Vitamin C, which are specifically compounded in our FDA approved laboratory for maximum potency and effectiveness. Digestive enzymes (like Papain and Alpha Amylase) are key ingredients for proper food breakdown and assimilation. Alfalfa is considered to be a very nutritious herb, and is used to increase appetite, alleviate certain allergic reactions and help poor digestion. In its naturally balanced form it can help absorption of nutrients, and neutralizes intestinal track acidity. In conjunction with Blue Green Algae it can help heal intestinal ulcers, liver disorders, high blood pressure, Anemia, body breath odor, and cancer. Chicken Liver is good for anemia and aids in building healthy red blood cells. It is known to increase energy, fight liver disorders, and help relieve stress in the body. Whey Protein provides another excellent source of protein and is critical in building and maintaining muscle mass and other necessary metabolic functions. Beta-Carotene is converted to Vitamin A and becomes a powerful free radical scavenger in the body. Free radicals are known to damage healthy organs and cause a variety of health problems. Shark Cartilage contains collagen and glycosaminoglycans. This combination makes shark cartilage a powerful anti-inflammatory and wound-healing agent that is non-toxic and has no known side-effects. Studies performed at the Massachusetts Institute for Technology have shown that Shark Cartilage contains a protein that impedes the formation of blood vessels to tumors. 4. Proper Organ and Nerve Function. Selenium is an essential trace mineral that is able to inhibits the oxidation of lipids (fats) and has been found to function as a preventative against the formation of certain types of tumors. Vitamin B12 maintains fertility, promotes normal growth and development, and prevents nerve damage by maintaining the fatty sheaths that protect nerve endings. 5. Healthy Joints and Mobility. Oyster Shell is extremely rich in Calcium, the major constituent in the structural framework of bones. Iron is necessary for the formation of hemoglobins and myoglobins (a type of hemoglobin found in muscle tissue). Iron deficiency can cause weakness, anemia, digestive disturbances, fragile bones and hair loss. Blue Green Algae is a very rich chlorophyll source and has been shown to enhance the health of the entire body, strengthen the immune system, promote intestinal regularity and the healing of wounds, boost hemoglobin production and help purify the blood. Taurine (Feline formula only; dogs make their own) plays a vital role in maintaining the correct composition of bile and solubility of cholesterol. It is also an antioxidant immune regulator and has also been found to be necessary for chemical reactions that produce normal vision. Major considerations in formulating NuVet Plus were the human grade quality of ingredients and their nutritional values, as well as the bio digestibility and utilization into the cellular framework. We also considered the chemicals and toxins that find their way into our animals' food. NuVet Plus® was formulated to combat these harmful pollutants. NuVet Labs® has designed a cutting edge formula that we believe will help increase your pet's longevity and quality of life. Our scientists performed extensive research and experiments with a variety of vitamins, minerals, enzymes and herbs, until they created NuVet Plus®, which provides a powerful synergistic defense against the harm caused by free radicals. To read about the positive effects of a particular ingredient; read on the ingredient name below. A soluble fiber digestant. We believe NuVet Plus® is the finest pet supplement available, however it must be able to be digested as efficiently as possible. Alpha Amylase creates the means by which the ingredients will be absorbed into the body as rapidly as possible without diminishing NuVet Plus®' powerful antioxidant capabilities. Blue Green Algae is nature's most basic food. Existing at the beginning of the food chain, it provides nutrition in its simplest form. Blue Green Algae has a greater amount of protein than any other whole food. It provides the essential nutrients for the health of the physical body, and the smooth operation of the brain and nervous system. Blue Green Algae is a very rich chlorophyll source and has been shown to enhance the health of the entire body, strengthen the immune system, promote intestinal regularity and the healing of wounds, boosts hemoglobin production and helps purify the blood. The trace minerals found in blue green algae are Boron, Calcium, Chlorine, Chromium, Cobalt, Copper, Fluorine, Geranium, Iodine, Iron, Magnesium, Maganese, Molybdenum, Nickel, Phosphorus, Potassium, Silicon, Sodium, Tin, Titanium, Vanadium, and Zinc. Cat's Claw, also known as Una de Gato, is an ancient herb, found in the rain forest of Peru. This singular and wild woody vine is known for its amazing healing properties and has been used by native people for centuries. It cleanses the intestinal track, enhances the action of white blood cells, and acts as an anti-inflammatory and antioxidant. It is good for intestinal problems and viral infections. Research in different countries including Germany, Austria, England, and Hungary has shown that Cat’s Claw can stimulate the immune system and may help in the treatment of diseases including cancer, AIDS, viral or respiratory infections, allergies, arthritis and rheumatism. An essential amino acid that is not synthesized by the body and must be obtained from food or supplements. It is a powerful antioxidant and a good source of sulfur, which neutralizes free radicals and helps prevent skin, coat and nail problems. It can help to detoxify harmful agents such as lead and other heavy metals found in airborne pollutants. L Methionine is essential for the absorption, transportation and bioavailability of selenium and zinc in the body. It also acts as a liptropic agent to prevent excess fat buildup in the liver, and can help to reduce fatigue. It is useful in some allergy cases because it reduces histamine release. The proanthocyanidids in Pine Bark have been shown in clinical studies to be 20 times more effective than Vitamin C and 50 times more effective than Vitamin E as an antioxidant. Pine Bark helps relieve pain and symptoms of osteoarthritis, arthritis, rheumatism, and rheumatic fever. It has been shown to reduce histamine production, thereby helping the lining of arteries resist mutagen attacks which cause cardiovascular disease. Pine Bark’s remarkable ability to “seek and destroy” free radicals is a tremendous benefit to the health of our animals. By reducing oxidative damage to cells and vital tissues, what we recognize as aging (stiff joints, wrinkled skin, degenerative disease problems like arthritis, circulatory disorders, diabetes, heart disease, etc.) is held to a subdued rate. In addition, unlike virtually all other dietary antioxidants, proanthocyanidids readily cross the blood-brain barrier to protect vital brain and nerve tissue from oxidation. There have been numerous studies demonstrating the ability of shark cartilage to shrink some cancerous tumors, including those unaffected by standard treatments. In order to grow, a tumor must establish its own blood vessel network for nourishment. Like all other living things, if the tumor is denied nourishment, it will die. Studies performed at the Massachusetts Institute for Technology have shown that shark cartilage contains a protein that impedes the formation of blood vessels to tumors.